Description: Factory New & unfired American Tactical Imports GSG-1911 ADOP semi-auto SA pistol in .22LR. 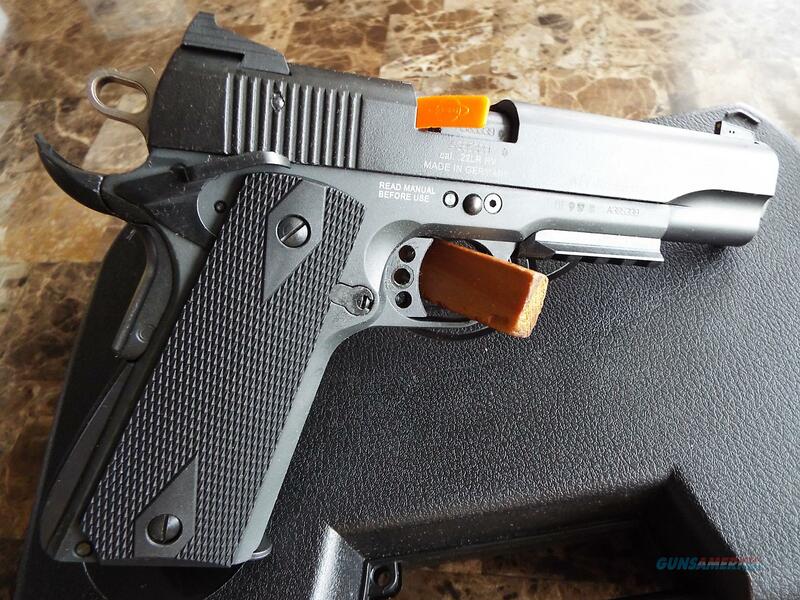 The .22LR version developed by GSG retains the Model 1911's classic uniqueness along with exciting new technology and features, including several safety functions to meet today's rigorous standards. From casual plinking to competitive shooting, the GSG 1911 belongs in the hands of everyone who wants an excellent pistol at a great price. Features: Same Look and Feel as Full Size M1911. 4" Faux Suppressor. Ambi Thumb Safety. Beaver Tail Safety Grip. 2" Picatinny Low Tactical Rail. Single Action. Compatible w/ many standard 1911 parts. Specs: Caliber: .22 Long Rifle HV. Height: 5.5". Length: 12.5" w/ Suppressor. 8.5" w/out Suppressor. Weight: 34.4 oz. w/out Suppressor. Mag Capacity: 10-rds, one factory mag. Finish: Black Anodized. Material: Zinc Alloy. Low-Profile Adjustable Rear Sight. Includes three (3) Front Sights (Low, Med, High). Black Synthetic w/ Double-Diamond Grips. 5" Threaded Barrel, Steel. Aluminum 3-hole Skeleton Trigger. LAYAWAY price is $305 with PRIOR approval only. 120-days max. FIRST, please send message requesting layaway terms. No phone calls to start layaway process. Mfgr warranty. All papers. Please see all terms. Thanks! range, target, M-1911, not a .45acp, hunt, hunting, varmint, varmit, TB.